Imagine that a building suddenly grows taller, offering a better view of the surrounding scenery from its higher vantage. It would also cast a longer shadow and stand out more. The consequences for its neighbors could be hard to predict in advance. That's Burlington's dilemma. The city is considering zoning changes that could alter its skyline and transform what is now a decidedly low-rise burg into a higher-rise urban center. Developer Don Sinex has proposed building two 14-story towers as part of the $200 million makeover of his Burlington Town Center mall. That would require changes to the 105-foot height limit now in place downtown. The towers would contain about 300 units of housing, likely apartments and condos. They would face Cherry Street in the heart of the Queen City and would rise about 150 feet, making them the tallest buildings in Vermont. Currently, that superlative belongs to Decker Towers, an 11-story affordable-housing complex at 230 St. Paul Street in Burlington that, by city measurements, rises 116.3 feet. Although they have not been formally proposed to the Burlington Development Review Board, the twin buildings were part of Sinex's pitch in the public design process now under way for the mall project. City officials are discussing a possible zoning change to allow the higher structures and plan to make a proposal to the planning commission and city council, both of which would have to OK the tweak. 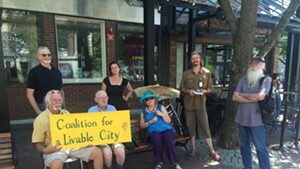 "I think that the challenge here is doing it well," said David E. White, director of the Burlington Department of Planning and Zoning. "I think you can do taller, and you can accommodate the growing needs of the city, whether it's for housing or for office space. I think you can grow taller as long as you do it in a way that's really sensitive to the context of the buildings around it." The mall faces historic Church Street. It's on a parcel that once hosted an Italian American neighborhood full of homes and shops. They were bulldozed in the 1960s during the national urban renewal craze, forever altering the character of the northwestern corner of downtown between Church Street and Lake Champlain. The mall, office buildings, a hotel and a parking garage replaced the neighborhood. The shopping center thrived for years after it opened in 1976, but today it's plagued by vacancies, and many consider it dated. Sinex purchased it in 2013 and proposed the ambitious project in 2014. While various questions surround the proposal, height is the central issue. Because many of the historic buildings in the Cherry Street area were demolished decades ago, the towers could conceivably be designed to fit in, White said. Their shape and size are critical, he added. Renderings show wider base stories aligned close to the street, and narrower silhouettes as the structures rise. Although the images are preliminary, this shape could reduce shadows and lessen the visual impact of the higher floors because they would be set back rather than loom directly over the street. A computerized solar study to chart how different designs cast shadows would be part of the review process, White said. The 14-story buildings would be large in scale for Vermont, but miniatures in a world where the highest skyscraper — in Dubai — is a towering 2,717 feet. As cities such as New York and Chicago grew, early skyscrapers, including the Empire State Building and the Sears Tower, were viewed as marvels of engineering and signs of man literally reaching for the stars. They symbolized strength, power and promise. The One World Trade Center, 104 stories at the site where the September 11, 2001, attacks destroyed the twin towers, serves effectively as a monument. But skyscrapers don't appeal to everyone. Some of the best-loved cities in the world are known for their low profiles: Rome, Washington, D.C., Venice, and many parts of Paris. And some skyscraper zones have long, dark shadows and little greenery to soften all the glass and concrete. "There are some places that are just awful canyons," conceded Peter Owens, director of Burlington's Community and Economic Development Office. Owens believes Burlington has room for carefully placed and well-designed higher-rise buildings. Portland, Ore., and Vancouver, Canada, are examples of cities that have done it right, he said. "Do we want to have Manhattan? Absolutely not," Owens said. "But is there a place for some taller buildings in Burlington that will not adversely impact the overall character? My sense is, there is." Some observers are wary. Matt Viens is president of the board at Preservation Burlington, a local nonprofit that works to protect and improve historic structures. "The Burlington Town Center owes its existence to the misguided policy of urban renewal, which saw the destruction of historic structures and neighborhoods," Viens said. "While in some respects the proposed redevelopment seeks to remedy some of these mistakes, Preservation Burlington would urge caution. It is not clear why the goals of redevelopment, including the creation of new residential space, cannot be met by building within the city's current height limits." Under current zoning, the 105-foot downtown building height limit usually translates to 10 or 11 stories. Higher structures are allowed under special zoning rules in two other locations: up to 140 feet on the University of Vermont campus; and up to 180 feet at the University of Vermont Medical Center. At about 101 feet, the hospital's proposed inpatient building would be among the tallest structures in the city. But unless you count the steeple on Ira Allen Chapel, which tops out at 165 feet, according to real estate data mining firm Emporis, no buildings at UVM or the hospital campus come close to the maximum allowable zoning. So the tallest building in the city is still down the hill — Decker Towers, which was constructed in 1971, before Burlington's current height limit was imposed. It was built in a ravine just south of downtown, making it less visible, which might be a good thing. While Burlington has many notable buildings, the city's tallest structure does not show up in brochures promoting the city or on postcards tourists send home. The bland, block-like building lacks detail. Its underwhelming design could be seen as a recommendation against towers or as a challenge to put something more exciting in the city's top spot. As the mall plan is discussed, city officials are weighing proposed new zoning for downtown called form-based code. It's unclear whether the new code will be approved by the time the mall renovation comes up for review, or whether the mall will be reviewed under the existing regulations. Either way, the planning commission and city council would have to approve language explicitly raising the height limit before the towers can be permitted, according to city planner White. Measuring building height is not a simple exercise, and that's reflected in height limits. The limits for UVM and the hospital involve a complicated formula meant to recognize that they are on a hill overlooking the city, for example. Building height varies depending on what side is measured, and whether rooftop mechanical equipment and features such as solar panels are taken into consideration. Stories are not standardized. A building with higher ceilings and fewer stories might end up being taller than a structure with lower ceilings and more stories. For these reasons, height limits are often formulated with a maximum number of feet as well as consideration of stories. So what are the tallest buildings in Burlington now? According to a list formulated by the city planning and zoning department, which includes rooftop mechanical equipment and solar panels in its calculations, the office building at 100 Bank Street measures 116 feet, making it just a hair shorter than Decker Towers and putting it in the No. 2 slot. 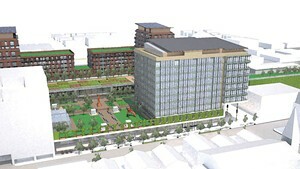 Next come Westlake Residential, at 107.5 feet; Key Bank, 105 feet; and Cathedral Square, 103.3 feet. Seven Days recently spoke to people at busy Cherry and Church streets, within view of the mall site, posing the question: Should Burlington grow up? "I just think Burlington is pretty the way it is," said Amy Hock, a Northfield retiree. "I don't know why they would need to build higher." The low-rise character is part of Burlington's appeal, Hock said. "It makes it kind of an intimate place, and a lot of people like to come here for that reason." Also opposed to growing up: Barbara Swantak, a receptionist from East Corinth. "I think it's a terrible idea," she said. "If you're on the lake you don't want to look over and see that. If you are on the hill coming down, you don't want to see it either." But others like the idea of a growth spurt. High-rise buildings would make Burlington more cosmopolitan, they say. "I definitely would like to see it go up, at least a little bit," said Maggie Stevens, a retail worker and student at Champlain College. Fourteen stories sounds about right, she said, and she's eager to see the mall redone. "I think it would be cool to have something a little bit new and different ... Change is good." Much is at stake as Burlington looks upward. "I think well done, it would enhance the character of Burlington," Owens said. "Poorly done, it would be a disaster."